President Ronald J. Guerra joined our operations as a captain in the Kaiser companies flight department. He has been president since 1979 when he and other executives purchased the organization following the voluntary liquidation of the Kaiser Industries Corporation. Ron has more than 21,000 hours of flight time and has flown to six continents. He is licensed as a command pilot in the Gulfstream GI-II-III-IV-V aircraft, along with other airline ratings. He has been a team leader for 40 aircraft modifications, including 18 Gulfstreams plus Hawkers, Falcons, JetStars, LearJets and Citations. Mr. Guerra was the recipient of the John P. “Jack” Doswell Award for meritorious service to aviation in 2005 by the NBAA. His expertise, experience and Aviation Industry Leadership gets passed on to you, our client, in the form of the highest safety and customer service standards in the aviation industry. Rob has been flying airplanes since he was a young man. He has recently taken on greater administrative and operational duties within the company. He joined KaiserAir in 1994 as a pilot after his graduation from California State University – East Bay with a bachelor’s degree in business administration. Rob is currently a senior captain and an FAA-designated Check Airman, with 20 years of experience flying Citation, Hawker, Gulfstream and Boeing jet aircraft. He has domestic and international flight experience and has more than 8,500 hours of total flight time. In addition to being an outstanding pilot, Rob is an avid sportsman and car enthusiast. Chief Pilot David Mancebo joined KaiserAir in 1984. He was promoted to assistant chief pilot in 1991, then to chief pilot in 2000, and to Director of Operations in 2011. As Vice President and Director of Operations he supervises KaiserAir’s staff of more than 30 pilots. He has more than 10,000 hours of flying time and has flown more than 3 million miles. Captain Mancebo is type-rated in the Falcon 900, Gulfstream GIII, GIV, GV, Citation, and Hawker aircraft. Bronte was born and raised in the SF Bay area then graduated from Embry-Riddle Aeronautical University in Florida before joining the US Air Force, where he became an Instructor Pilot. Bronte joined KaiserAir in 1992 and has over 11,000 hours flying time as a Captain on our Gulfstream G3, GIV, GV, G550 and the Hawker HS 125 aircraft. Bronte was based in London for 8 years where he was in charge of KaiserAir’s international operations. He returned back to Oakland in 2012 to become the Chief Pilot of KaiserAir’s Part 135 Flight Department. 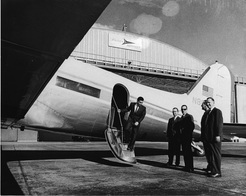 Glenn joined KaiserAir in March, 2008, as General Manager of the KaiserAir Santa Rosa Jet Center. He took over as Vice President, Maintenance at both Oakland and Santa Rosa KaiserAir locations in August 2010. ​Glenn is a licensed A&P mechanic, with FAA designated Inspection Authorization. He was a FAA Designated Airworthiness Representative (DAR) and he holds a Commercial Pilot License as well as a Flight Instructor Rating that he has held for several years. Glenn's previous positions and responsibilities have included Repair Station Manager, Quality Manager for Manufacturing, Chief Inspector, Airport Management, FBO Manager, Flight Instructor, Director of Maintenance and Lead Mechanic. Rick joined KaiserAir, Inc. in 2014. He has been in and around business aircraft MRO (Maintenance and Repair) operations for 32 years. Rick has held leadership positions with some of the world's largest aerospace manufacturers as well as both large and small business jet MRO’s. Rick has an extensive background in aircraft modification and STC (Supplemental Type Certificate) projects. Rick holds a commercial pilots license with an instrument rating and has flown over 2,700 hours.